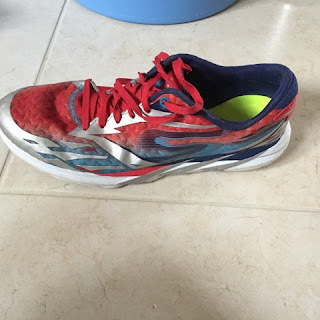 The Gorun speed is sometimes known as the Gorun Meb as these are the shoes which were designed for top US marathon runner Meb Kaflezghi. They are the second lightest shoes in the current range weighing in at 202g for my UK size 7. I have now run over 200 miles in the shoes so they have had a decent test on runs of up to an hour on tarmac including speed and hill work. The wear is about what I would expect; they are still good for a few hundred more miles. Like all Skechers runnning shoes these have M strike technology which helps promote a mid foot landing. Straight from the box I found these to be very comfortable - they are very light and feel fast. They are breathable and give sufficient support. I preferred them to the original speeds although the original speeds as they are of a softer material and the heel is much better. However, to look at the original still remain my favourite and are the prettiest shoes I have owned! The Gorun speed 3 looks quite different to the original (I don't have the 2 so can't compare). 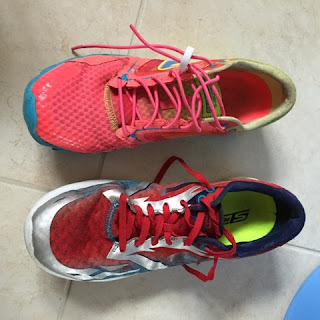 My original speeds (pink) were size 6.5 compared to size 7 for the 3 - this is because I prefer to have a bit more space so now go for a slightly bigger size. The new model is not as narrow; I prefer the fit around the heel - the original were tight around the heel and initially caused blisters. The shoes come with two sets of laces - slightly elastic (the ones I am using) and normal. Due to the heel fit not being as tight I found I needed to use the top hole otherwise the shoes were slipping around on my feet. 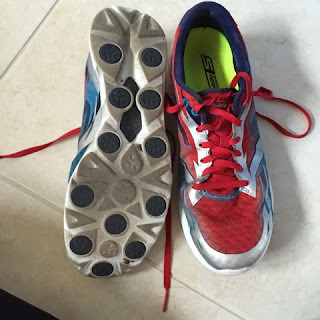 I don't use the top hole on the Gorun4 so I think the speeds might be bigger around the heel. 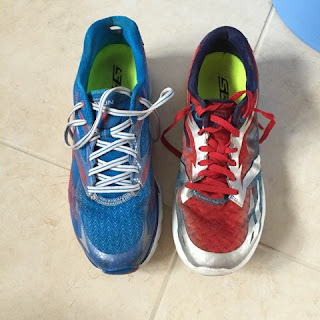 The Gorun speed 3 is very similar to the Go run 4 - both have a 4mm drop and are considered a racing shoe. The Gorun 4 are 10g lighter in a size 7. It has taken me some time to decide which I prefer as they are so similar. If you have a cadburies Jaffa cake one day and a Mcvities the next you probably will find it hard to choose a favourite as they are so similar. The only way is to have one immedietly after the other so today I did a lap in the speed3 then a lap on the gorun4. My favourite was the Gorun4 because they are a little softer. The speeds are more firm (but also more responsive so probably faster). When I say firm I do not mean inflexible just not as soft underfoot as the ride4. There really isn't a great deal in it. However, if I had a choice between pink speeds and yellow runs then I would probably choose the pink speeds - that's how little there is in it!